At the event held at the headquarters of the United Nations Educational in Paris last week Irina Bokova, UNESCO Director-General, remembered the 16th World Summit of Nobel Peace Laureates in Bogota that she attended in February 2017. At the meeting Unesco Director General, Irina Bokova also, expressed support to peace in Colombia. ‘Unesco is accompanying the people of Colombia and you, mister President, to support each man and woman along this path’, affirmed in a speech given before a full auditorium in the Paris headquarters of that United Nations organization. 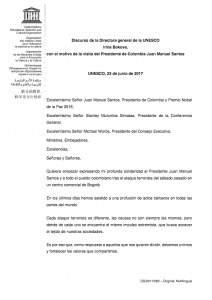 Bokova expressed her deep solidarity after the attack perpetrated recently in a commercial center of Bogota and estimated those incidents are born from the extremist impulse ‘that looks to undermine the fabric of our societies’.The director of Unesco stressed that the Colombian people has achieved what seemed impossible, thus showing the power of dialogue and the spirit of reconciliation. ‘We need your experience and knowledge to help us disarm the conflicts, to show people there are alternatives to violence’, she said. For his part, Santos emphasized the importance and validity of the Unesco mission that looks to ‘build peace in the minds of men and women’.’It is our challenge and a challenge of all humanity, maybe the most pressing: build peace in the country and the cities, in each niche of our territories, but -above all- build peace in the minds and hearts of persons’, he commented. The head of State said his country has arduous work before it, as half a century of armed conflict and violence affects the capacity to coexist and be compassionate of any society. However, he added, for that is necessary to follow the way shown by Unesco, that is, to promote education, culture, science and communication. Santos referred mainly to the efforts of his country to guarantee education making it accessible and of quality for all and stressed that for the first time in national history, over the last three years, the budget destined to that sector is the highest in the economic plan, even higher than that of security and defense.The head of State reiterated the will to advance in the construction of peace, that is ‘changing bullets for votes, weapons for arguments, violence for democracy’. Santos concludes this Friday a three-day visit to this capital on occasion of the France-Colombia Friendship Days 2017, aimed at strengthening the links between both countries.  The last Summit of Nobel Peace Laureates took place in February 2017 in Bogota, Colombia and gathered about 30 Laureates and Prize Awarded organizations. UNESCO event took place the 23 of June in Paris. Among attendees were Juan Manuel Santos, President of Colombia, Irina Bokova, Director General of Unesco. Ekaterina Zagladina, President of the Permanent Secretariat of the Summit also attended. English quotes are given according to Prensa Latina.